Seattle, Washington, November 20, 2013 -- Vizua Corporation, a Seattle based company and developer of the world's first interactive, cloud-based 3D visualization, sharing, collaboration and printing software platform and 3D Systems (DDD:NYSE) of Rock Hill, South Carolina announced today that 3D Systems will develop a 3D software marketplace website platform powered by Vizua's 3D software platform technology to further enhance and expand the printing of high-definition 3D data.
" A strategic technology partnership with 3D Systems serves to validate the power and potential of our visualization, sharing, collaboration and printing software platform ", said Sylvain Ordureau, CEO of Vizua. " We are very enthused to have this strategic relationship with 3D Systems and envision a strong synergistic future that capitalizes on the strength of our interactive 3D software platform with their leading 3D content-to-print solutions. " visualization technology ", said Avi Reichental, CEO of 3D Systems. " This new cloud based solution will allow segments such as healthcare services and medical education to democratize access to full color, 3D printable models that will enhance communication, collaboration and ultimately, improve patient outcomes. " Vizua is a Seattle, Washington-based company founded by veteran executives in technologies that store, manage and display high-definition, 3D images for work and play. Vizua's 3D software platform solution provides professionals and consumers an image viewing, exploring, sharing and 3D printing solution that shatters the performance and collaboration limitations of other systems, facilitates discussion between consulting professionals, helps consumers better understand a professionals findings and recommendations at a competitive price point. Vizua scans can be easily and instantly accessed by anyone from their computer or mobile devices, removing the time consuming management and loading of CD-ROMs or the printing of 2D views that lose the spatial positioning information. For more information visit www.vizua3d.com. 3D Systems is a leading provider of 3D content-to-print solutions including 3D printers, print materials and on-demand custom part services for professionals and consumers alike. The company also provides CAD, reverse engineering and inspection software tools and consumer 3D printers, apps and services. Its expertly integrated solutions replace and complement traditional methods and reduce the time and cost of designing new products by printing real parts directly from digital input. These solutions are used to rapidly design, create, communicate, prototype or produce real parts, empowering customers to manufacture the future. For more information on 3D Systems visit 3D Systems.com. See how Vizua3D.com is helping the veterinaries at the Chicago Brookfield Zoo to explore various species anatomy, teach and plan treatment for their multitude of patients without breaking the bank. Sylvain works in the French medical community and has created two companies: Useful Progress in France and Vizua in the USA who develops software to allow medical students to perform virtual dissections and training for Digital Anatomy. Vizua has another string to its bow: the archiving and dissemination of radiology reports. Today a hospital with x-ray equipment uses PACS (Picture Archiving and Communication System) to work with these scans, but PACS systems cost upwards of ?100,000. With Vizua, which operates in the cloud, scans, once made, are encrypted and sent to the cloud service of Vizua (located in Toronto, Canada, available with a latency of 40 milliseconds, which is very fast) for just $300 per month. The patient can access their account Vizua for free and can share them and seek the advice of other experts. Sylvain gives an example with a small hospital that performs 3,000 scans/year for a maximum volume of 30 gigabytes ? that is spending ?100,000 for archiving its scans: "It's a bit much ..." Moreover, other tests such as MRI scans have even larger cross-sectional images and new scanners can generate files of up to 60 gigabytes! What is the protocol used by Vizua? "This is a format that was launched in the U.S. following the HIPAA guidelines.? In fact, Vizua can act like a Dropbox for radiology files. How many radiologists are there in France? How many scans do they do per year? And the USA? France is a little smaller in this area ... for example we have much less equipment of this type than Germany. In 2005 we had the same number of scanners per capita as Turkey (it is true - as they say - that all civilizations are not equal). Why is this? "You have to ask the Bar Council and the gentlemen of the Ministry of Health ..."
Normally French health data must remain in France ... no problems to store them in Canada / USA? Sylvain says he is he not a DMP (personal medical record) - "We are one element of DMP: we link the radiological examinations with the reports for the doctor". Who pays in this system? "Today it is the radiologists (this is cheaper than investing in a PACS) but we are negotiating with insurance companies and other people interested in housing data for their clients. The Italian Government is also interested to install Vizua in Verona for all Italians". And if the radiologist gives the patient his scan on a CD? It is simple - the patient can upload the scan himself to Vizua from his computer. What is the business model? "Health is our focus ... but we also have applications in automobiles, diamond dealers, museums ..."
And if Sylvain was President of the French Republic, what would he do to improve health in France? Sylvain takes the example of obesity ... (there are 300,000 obese people in Paris). We should scan obese patients. Why? "Do you know how expensive hospital beds are per day?" There are about 1 million health professionals in France. So with all the tools we have today on the internet we could better organize the sector. But on the other hand, I'm not sure all these people have interest in changing their practices. But fortunately we have some rogues like Sylvain, who by dint of giving a few kicks into the anthill want to reform this sector. It will also be society itself that will make the change happen by putting their health data in the U.S. So why am I worried? After all, my surgeon did what it takes to keep me alive! Certainly, but if the emergency organization had been more modern, the surgeon would have had a simpler heart bypass procedure. Also I spent 6 months in hospitals in the Republic (including a private clinic). A ?1,500 a day (figure quoted by Sylvain) that's a lot of cost borne by the community. I believe modern systems would quickly clear the social security debts. Not to mention what will happen naturally with preventive medicine and genomics. But do our professionals have an interest in investing in preventive medicine? A three-dimensional (3D) view does more than make for exciting movies in a theater, it can also improve the care of animals. The Chicago Zoological Society's (CZS) Brookfield Zoo is the first North American zoo to use revolutionary 3D imaging technology with on-site digital radiology and CT equipment in its state-of-the-art animal hospital. 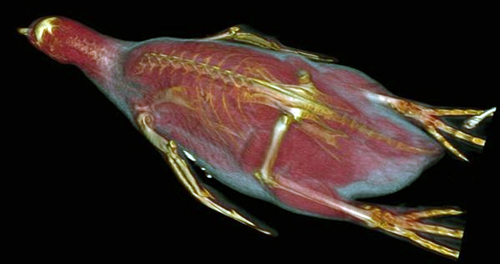 The new technology allows the Society's veterinarians to enhance two-dimensional CT (CAT) scans, MRIs, and ultrasounds with 3D models that will enable them to better treat zoo animals. The imaging will be particularly useful in the planning of surgeries, especially in difficult cases that were impossible to treat with 2D imaging. Zoo veterinarians have already aided several animals in ways never before possible. For Hoover, a 17-year-old aardvark, a 3D scan revealed that a hole from a missing tooth was draining into a sinus cavity. The diagnosis would have been impossible without the new imaging, and veterinarians are now monitoring the condition to prevent future health complications. Another animal benefiting from the technology is Pilgrim, a 9-year-old African crested porcupine, who requires regular tooth trims. Animal care specialists were at one point questioning if one of Pilgrim's incisors, which continued to overgrow, should be extracted. The 3D imaging was helpful in showing why this extraction would be potentially risky and more difficult than the continued trimming. The 3D renderings showed the anatomy of the incisors and their very close proximity to many other structures that would add to the difficulty of the procedure. "This is exciting new technology that gives us much more information about our animals here than we've ever had before. We can use this information to improve our treatment and for proactive care to help ensure their well-being," said Tom Meehan, DVM, vice president of veterinary services for CZS. "The more we understand and see an animal's anatomy the more we enhance our ability to provide the highest quality of care." Dr. Meehan added that the technology provides a better visualization of various tissue densities simultaneously, while CT and MRI scans allow the viewer to choose only one or the other. Veterinarians are already also using the imaging to better care for a California sea lion, a bald eagle, an addax, and a Humboldt penguin. Vizua (www.vizua3D.com), the company providing this imaging solution, first showcased the technology this past November at the Radiological Society of North America 2011 Scientific Assembly and Annual Meeting in Chicago. The Seattle, Wash.-based company provides affordable real-time imaging technology that allows technicians to convert previous CT scans into a 3D form without needing to purchase new equipment or software. These 3D interactive images can then be explored and shared instantly with doctors and their patients anywhere in the world just using their existing Web browser. "This is a first-of-its-kind cloud-based technology that allows anyone anywhere to see, explore, and share," said Dean Lester, Vizua CEO. "We are very excited that Brookfield Zoo is the first animal hospital to utilize this technology, and we are working closely together to ensure excellent care for the animals," added Jean-Manuel Nothias, director of Vizua Biomedical Partner Relations. Since first using the technology, Chicago Zoological Society veterinarians have made several JPEG photos and movie files to illustrate their findings and track animal health on an ongoing basis. These images will be valuable teaching tools for students and residents within programs at the zoo, including the Society's formal veterinary student training program through the University of Illinois College of Veterinary Medicine. From deep within The Field Museum's vaults comes the mysterious world of mummies. Opening the Vaults: Mummies gives a rare, up-close look at mummies some not on public view for over a century and the new discoveries by Field Museum scientists. 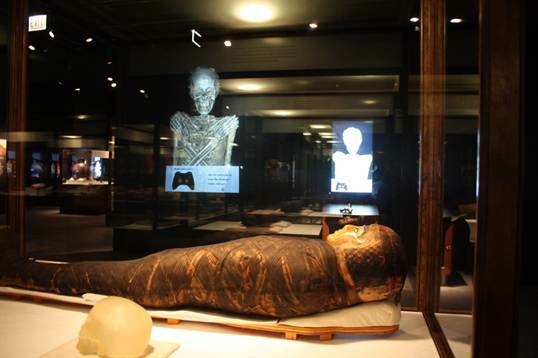 Showcasing a unique selection of over 20 mummies including one of the oldest mummies in the world discover why mummification was not just for royal Egyptians. 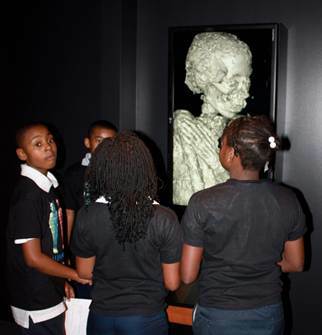 Vizua technology powers the interactive exhibits allowing visitors to open the vaults and virtually explore inside 4,000 year old mummies that have never been unsealed. CHICAGO - This week at RSNA 2011, Siemens announced the winners of its second annual International CT Image Contest, which attracted more than 600 submissions from 43 countries in seven medical categories. A 3D reconstruction of a CT image created by Dr JF Paul was selected as the winner of the pediatrics category. Dr JF Paul is our advisor since 2 years. He helps us to develop relevant high quality images in volume rendering. Submitted by Dr. Jean Francois Paul from Centre Chirurgical Marie Lannelongue in France, the high-definition 3D image features a visualization of an aorta aneurysm in a 13-month old baby. It was recognized as an impressive example of how valuable diagnostic information can be obtained using low-dose scans. At RSNA 2011 in Chicago this week we took an opportunity to see a demo Vizua's system for radiological image sharing. The cloud-based system allows anyone practically with any modern computer or mobile device to see and navigate through rendered data sets from a variety of modalities. Rendering is done on the server and the images are streamed directly to the device, allowing for beautiful, high res images without needing a powerful processor. The system is not FDA approved for diagnostic purposes, but is meant to be used to share relevant imagery with patients and other physicians. SEATTLE ? Vizua, the world's first interactive, cloud-based 3D scan visualization and collaboration platform, will debut at RSNA 2011 on November 27 in Chicago. Designed to extend the capabilities of radiology practices, Vizua enables real-time exploration and sharing of high-definition 3D views created directly from traditional 2D scans. Because Vizua is accessed through a web browser, the technology works on any system and costs less than today's 2D offerings. "Vizua takes the 2D sliced views produced by MRI, CT and ultrasound scans and combines them to create a 3D model that can be viewed on any system and shared instantly with anyone around the world," noted Dean Lester, CEO at Vizua. "With performance and collaboration capabilities that surpass those of all other systems on the market today, Vizua enhances communication between radiologists, physicians and patients without the need for major capital investment." Vizua's high-performance cloud platform delivers powerful 3D image viewing, sharing and printing solutions for professional and consumer applications. © Copyright 2013 Vizua, Inc. All rights reserved.